Both GOG.com and Steam versions are fully compatible with Windows Vista and later. Retail versions are fully compatible, but require patching and configuration to get working. Game removed from GOG.com and Steam in January 2015. Has 3 Releases, The Original, Director's Cut, and some copies of Director's Cut came with an extra disc with patches to fix problems in the 1-disc version. Steam version can be ran without Steam running, and is DRM-free. The scream.cfg location differs between releases. 1024x768 only. Editing in custom resolutions into scream.cfg causes major issues. Windowed mode is unplayable, but can be achieved through editing scream.cfg. Game uses software rendering, resulting in absurdly high frame rates. Affects camera speed. See Run the game at screen refresh rate. Attempting to run the original Scratches or Scratches: Director's Cut on Windows Vista or above will cause Windows to crash to a blue screen. This issue is caused by how modern Windows handles an outdated call for the monitor refresh rate. Change RATE 0 to RATE 60. The explanation for the problem and how it can be fixed was provided by the original developer of the game. The original version of Scratches is prone to crashing on modern computers. This issue was initially due to features that were added to Intel CPUs at the time, features that have since become standard in all Intel CPUs. Download and install this patch for Scratches. A mirror of this patch is available here. This patch was provided by the original developers during this game's original run. This patch will break compatibility with existing save files. 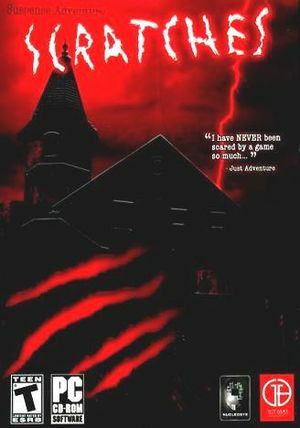 The initial release of Scratches Director's Cut came with only one disc, which contained a game breaking bug that would cause the game to crash during the additional content chapter of the game. Future releases had two discs, with the second disc containing copies of the patches below, as such this issue should not be present on those copies, so long as the patches on Disc 2 are installed. 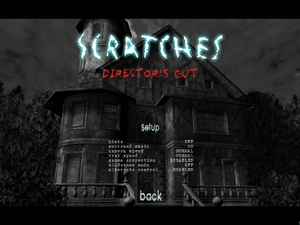 Download and install this patch for Scratches Director's Cut. A mirror of this patch is available here. Download and install this update for Scratches Director's Cut. Only a mirror is available for the update because of Wayback Machine's file size limit. The update dramatically improves the visuals of the game overall, and fixes some minor visual bugs. Change RATE 60 to the screen refresh rate (e.g. RATE 120). ↑ 1.0 1.1 File/folder structure within this directory reflects the path(s) listed for Windows and/or Steam game data (use Wine regedit to access Windows registry paths). Games with Steam Cloud support may store data in ~/.steam/steam/userdata/<user-id>/46460/ in addition to or instead of this directory. The app ID (46460) may differ in some cases. Treat backslashes as forward slashes. See the glossary page for details.